Spokane Rain Gutter is a truly family owned business with deep ties in the local community. Chuck and Elaine Mullinex got their start back in 1992 with a bedroom-turned-office and a single truck. Together, they created a business with a reputation for exceptional customer service, expert installations, and reliable maintenance. In 1997 Spokane Rain Gutter relocated to its current site of operations: 8710 E. Sprague in the heart of the Spokane Valley. The business began with Chuck and Elaine in a home and is now an industry leader and one of the most trusted gutter companies in the area. We at Spokane Rain Gutter believe we’ve gotten this far because we follow a simple philosophy of providing high quality and innovative gutter products paired with exceptional customer service. 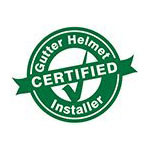 Gutter Helmet brand gutter guards are the most trusted form of protection on the market today. These additions can discretely slip onto the top of rain gutters to prevent clogging while allowing the free flow of water. Leaves, twigs, and other debris can easily clog an otherwise well-functioning gutter. Gutter Helmet stops this debris before it enters the gutter thanks to a slit that is only 3/8″ wide. The debris is forced out of the gutter onto the ground where it is easily swept away. Spokane Rain Gutter’s customer service is bar-none, the best in the business. Your complete satisfaction is our goal. With 21 years of experience and well over 17,000 satisfied customers, you can count on a pleasant and professional experience when you choose us as your gutter contractor. Keep your rain gutters clean with the help of Spokane Rain Gutter. Use our online form for a free quote or call (866) 959-1141.